Growing up on the east coast, to me Memorial Day has always meant the start of summer-- sweet Butter Sugar corn on the cob, weekends at Cape Cod and big summer blockbuster movie weekends. I never really considered that it also meant something else. Memorial Day is about heros. I’d like to introduce you to Carl and Ruth who inspired this week’s Happy Girl Experiment #4. Carl and Ruth. This is the pose they chose. I met Carl and Ruth Sunday morning outside the market when I was picking up ingredients for brunch. They had a little table set up outside the entrance where they were offering poppies to support veterans. Most people don’t make eye contact with vendors who set up tables outside the market selling candy bars or asking for petition signatures. Me included. I ran into the market and came out with ingredients for strawberry pancakes. As I was walking out the doors, the veteran caught my eye. He was standing proudly next to his table, holding a red crepe paper poppy in his hand waiting for someone to come over to him. “Carl, may I ask where you served?” He seemed to be in his 70‘s or 80’s. I had guessed World War II. He told me he served in Korea entering the service in 1946, serving in Germany where he met his wife, Ruth. I asked Ruth the secret to a long and happy marriage. I told them about The Happy Girl Experiment and that I would like to write about them this week. This proud couple said they loved the idea that together we would remind people about the real reason behind Memorial Day- to honor heros who have served our country. This weekend you will see veterans everywhere in parades, selling poppies to support veteran projects. Instead of walking by, donate yes, but also ask about their service. You’ll find that they want to tell you about what war they served in. Listen to them. It is someone’s grandfather, son, husband or wife. It is because of their service that we live in a country we can be proud of. If you have a family member who fought for your country, take them out to breakfast, listen to their stories, record them so your children will remember what heros they have in their family. Take two dozen donuts to your local Veteran’s Hospital. Send a package to a soldier in a current campaign abroad. Visit USO.org for more information. This week In the Happy Girl Lab, we are going to make a soldier happy. the only one like him until I met my husband. I’d like to take a moment to tell you about my grandfather, Paul J, the finest man I have ever known. 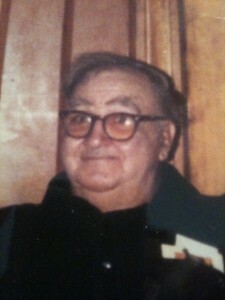 Pepe (French for grandfather) was a big, gruff man, a World War II veteran with green eyes, dimples and a limp. I remember listening to my grandfather’s stories about WWII. At the oddest times something would jog his memory. He wasn’t a talkative man but one of my favorite stories Pepe would tell me was when he was in occupied Paris. His intention was to buy the perfume for my grandmother. However, a few days later there was extensive bombing and when he went to check on Monsieur and his daughter he found the shop was destroyed. Pepe said this was the thing that devastated him most in the war. He realized good people were lost as well as beauty. This was not something I ever expected to hear from my grandfather. He said during the rest of his time in Paris he searched for Monsieur and Mademoiselle but he never saw them again, never knew what happened to them. He said it haunted him his entire life. I wish, more than anything that I had recorded his memories on tape. I close my eyes and I barely remember the sound of his voice. What I do carry in my heart is that my grandfather was brave and wonderful and that he found beauty in the darkest of places. Who do you know that is brave and wonderful too? The poppy program began after shattered bodies and minds returned from France following World War I and was an effort of veterans and their families to "take care of their own" and to remind the public of the debt owed to those who served and died. It has continued, honoring the war dead from World War I, World War II, Korea and Vietnam, Grenada/Lebanon, Panama, the Persian Gulf, Afganistan and Iraq, a tribute to America's citizen soldiers. Planned to coincide with the Memorial Day holiday, the annual event pays tribute to veterans who have died and the millions of Americans who have willingly served their country in eight decades. It serves and honors veterans with all proceeds from the distribution invested in local programs for the benefit of veterans and their families. Each nine-piece poppy is made by veterans for veterans in Auxiliary-sponsored Poppy Shops that supplement physical and psychological therapy needed by hospitalized and disabled veterans. The Auxiliary provides the materials and the volunteers. 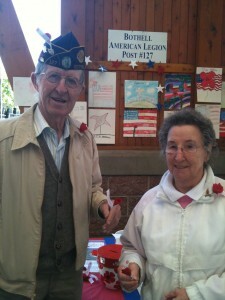 The veteran makes the poppy and is paid a small amount for each painstakingly made flower. For some, it is his or her only income. No matter what the cost of maintaining and supplying the Poppy Shops, the memorial poppy is never sold, but given in exchange for a contribution. The Poppy program has been part of Auxiliary programming for more than 70 years. It has been estimated that approximately 25 million Americans wear the poppy to honor America's war dead and veterans, contributing over $2 million for rehabilitation and welfare programs. The American Legion Auxiliary is a million-member veterans organization that complements the 2.8 million-member American Legion.